We gained the Silver Award in May 2017, well done to all. 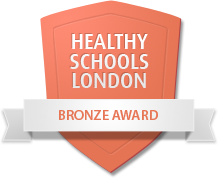 Carterhatch Infant School achieved the Healthy Schools London Status Bronze award in May 2016. This award celebrates schools that are helping make a difference for their pupils. To qualify for this we had to ensure we have a sound practice in promoting health and well being in place. We do this by teaching the children the importance of a healthy active lifestyle, beginning as soon as they join us in Nursery. We encourage and help children make healthy choices when it comes to eating, drinking and exercise. ready for us to begin work in September, we will keep you updated on how you can join in and help us achieve this. We have signed up to Sugar Smart Enfield, have a look at their Website to see how you can get involved and do you bit to ensure you know the 'Facts, stats and useful info about sugar'!